All around us the rhythm of the Tuscan countryside continues. Fields of crops that were green and growing when we arrived have been harvested and plowed ready, waiting for next season. The last week or so has seen hot settled weather. Temperatures have been in the low to mid 30s day after day prompting even the hardened locals to comment “troppo caldo” and roll their eyes skyward. 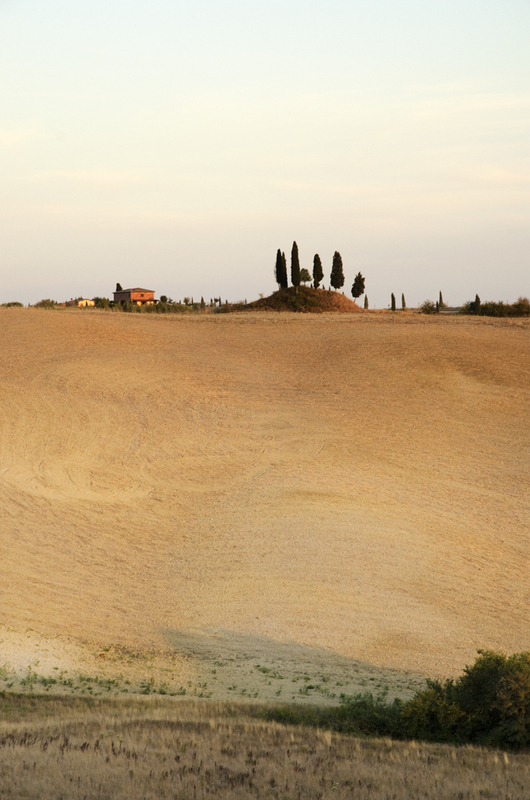 The countryside is dry and baked – under our Tuscan sun. Jean and I have taken hundreds of photographs over the last few months. We’ve put a selection of them into an album on our MobileMe site. There are some shots we have used in the blog but a lot of new ones. Follow the link and have a look. One thing we pondered when we arrived at Casavacanza Vesta was whether letters, packages or parcels from home could find us. While almost all of our correspondence is by email or text, we thought there may be the need for good old fashioned postage. You know, documents that need signing, letters that need reading and packages that need opening. Could the Italian postal system work it’s magic and deliver mail to our door? 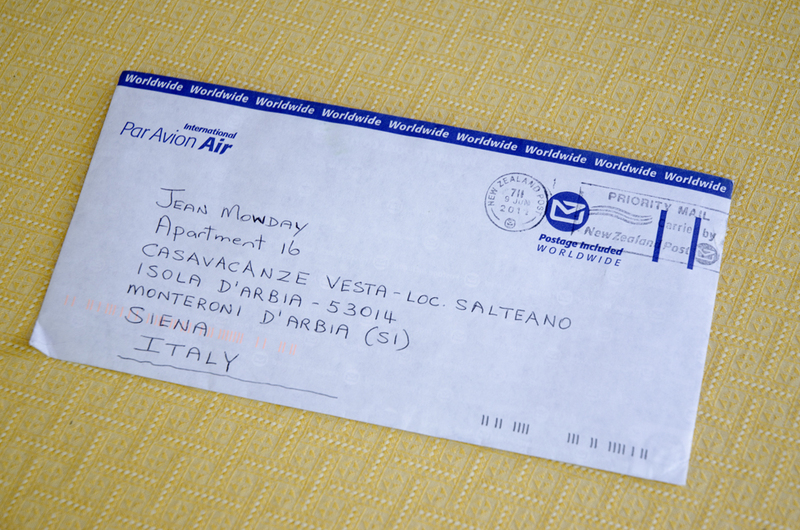 Jean’s Mum helped us out by mailing a test letter a fortnight ago and the good news is it arrived yesterday – lovingly delivered by Mrs Patritzia. She seemed a little surprised to be the final link in the Poste Italian supply chain as I suspect we were the first guests in Casavacanza history to get mail. So, gentle reader, let’s put Mrs Patrizia to work, feel free to write or, even better, send presents. Monday nights are rapidly becoming takeout pizza night. The little pizza shop in Monteroni D’Arbia now has two regular kiwi customers who are working through the menu with gusto. One thing that we have to perfect is getting the pizzas the 5 km to home hot. 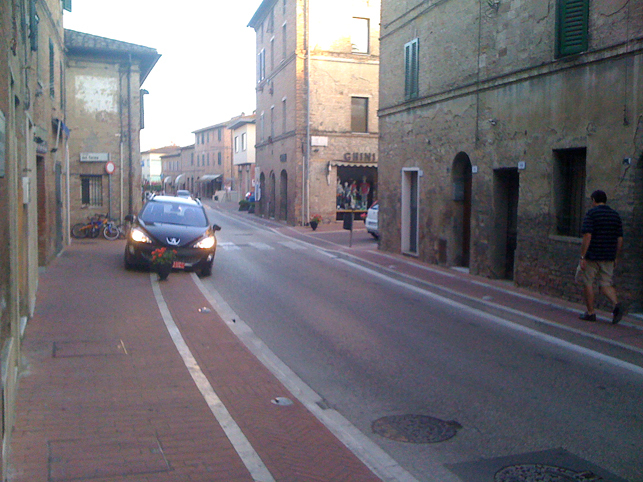 The first step was streamlining the pickup – which Jean achieved in true Italian style. In an earlier post I bemoaned the fact that when we arrived in May, Tuscany was green – bright green – not the usual mix of faded summer colours that, for us, have always defined the area. What a difference 6 weeks makes. Having explored as far afield as Radda in Chianti north of Siena and Buonconvento in the south, yesterday we strayed closer to home in Monteroni D’Arbia. This small hamlet is only 10 minutes from the cottage and is the centre of our small district. We first visited on market day about 3 weeks ago when the main shopping area was filled with stalls selling everything from clothes to meat to household appliances. Every day of the week there is a market in another local town and, rather than them just being a tourist attraction, they are an important part of local life both economically and socially. We attracted quite a bit of attention walking around, possibly because of our inherent elegance, but more likely because we had the girls with us. Daisy will, as you know gentle reader, take on any dog she sees be it Doberman or Chihuahua so our walk through the market involved a ballet of side steps and distractions as we spotted any oncoming dogs. Without the market Monteroni D’Arbia is still a delightful place to walk and browse the local shops. It’s not a picture postcard Tuscan village but rather a good honest working town. We stopped for a drink in the cafe on the main road and Jean shopped for plants and containers for our front verandah over the summer. Once again our mix of bad Italian, sign language and the good nature of the locals triumphed and we returned home with everything we wanted – including takeout pizza and beer for dinner. All up, a good day.